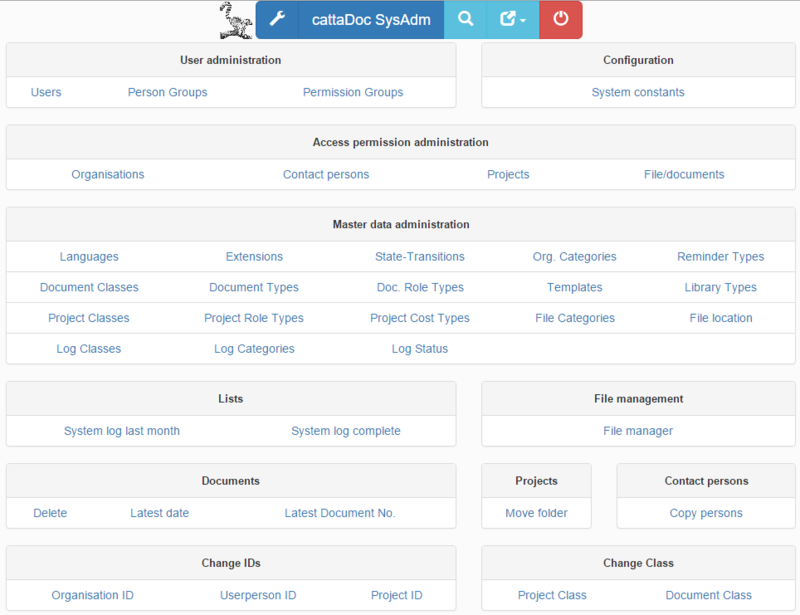 cattaDoc has a built-in system administration function accessible from the main Search menu - it is marked with at wrench icon: . It is, however, only visible and accessible when you are logged in as a system administrator. When you have followed the steps described under Installation you will - in step 5 - already have used the first part of User administration to define the first users in cattaDoc. The screen, Configuration of system constants, is divided into two sections by a horisontal line. The upper part (except for the system name - 'cattaDoc' is default) is required, the lower part is optional. Optional means that cattaDoc will function with the default settings. CDDOCROOT: Path to the document root, ie. for storing documents, as the operating system will see it, ref. The cattaDoc document repository. CDWDOCROOT: The document root, ie for storing documents, as the web server will see it. CDDOCPATH: The current path below the document root, ref. above: The cattaDoc document repository. CDLIBROOT: Path to cattaDoc library root, ie. for storing library files, as the operating system will see it, ref. The cattaDoc library repository. CDWLIBROOT: Web server path to cattaDoc library root, ie for storing library files, as the web server will see it. CDLIBROOT2: Path to cattaDoc secondary library root, ie. for storing archived library files, as the operating system will see it, ref. The cattaDoc archive library repository. CDWLIBROOT2: Web server path to cattaDoc secondary library root, ie for storing archived library files, as the web server will see it. CDGLOBALIMAGEFOLDER: Global image folder (server path) as the operating system will see it. CDGLOBALIMAGEWEBFOLDER: Global image folder (web path), as the web server will see it. You should now be able to use cattaDoc.